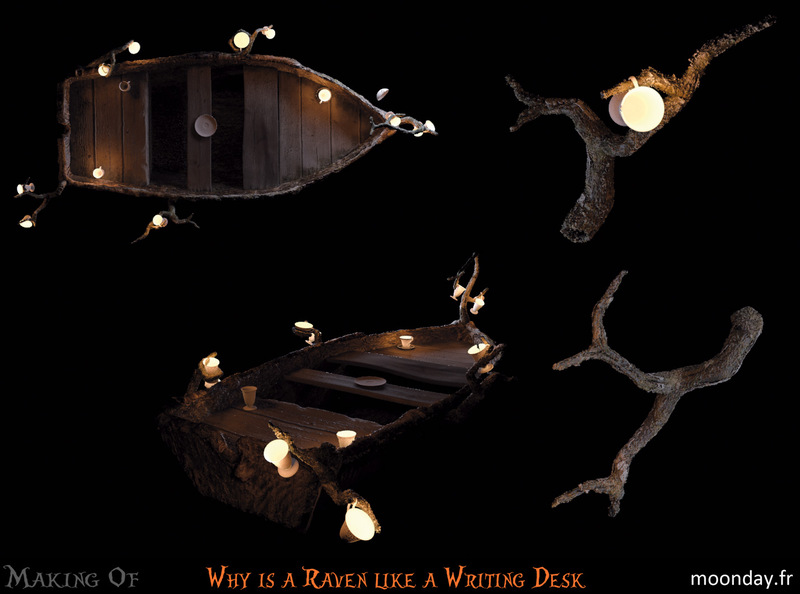 The artwork ‘Why is a Raven like a Writing Desk’ was initially created for a 2010 for a CG contest made by the website 3DVF about the theme: “Alice in your Wonderland“. 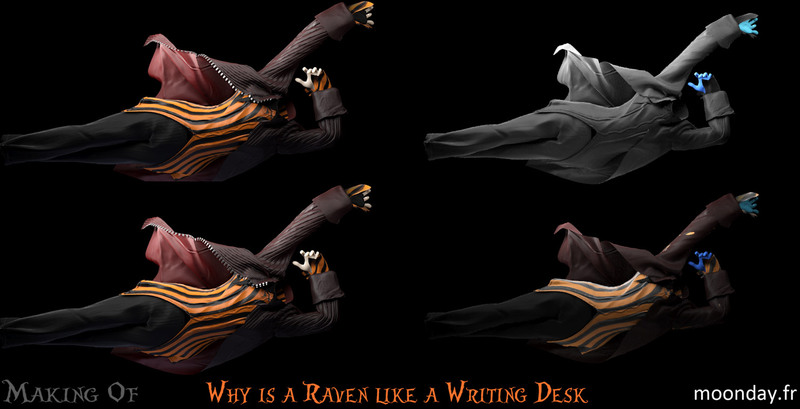 The contest ran for several months. Therefore I worked on that project on my sparetime. 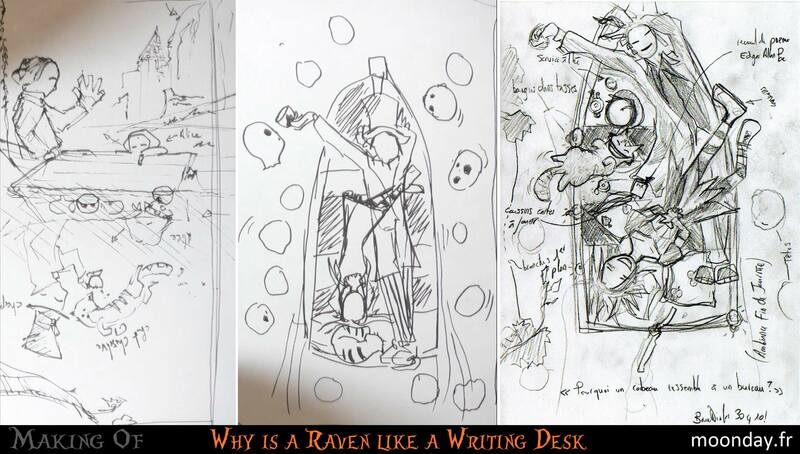 I immediately thought of using Alice and the Mad Hatter in a boat floating on the castle moat, the Tim Burton film scene where Alice jumps from one beheaded head to another one. This scene inspired me a lot. 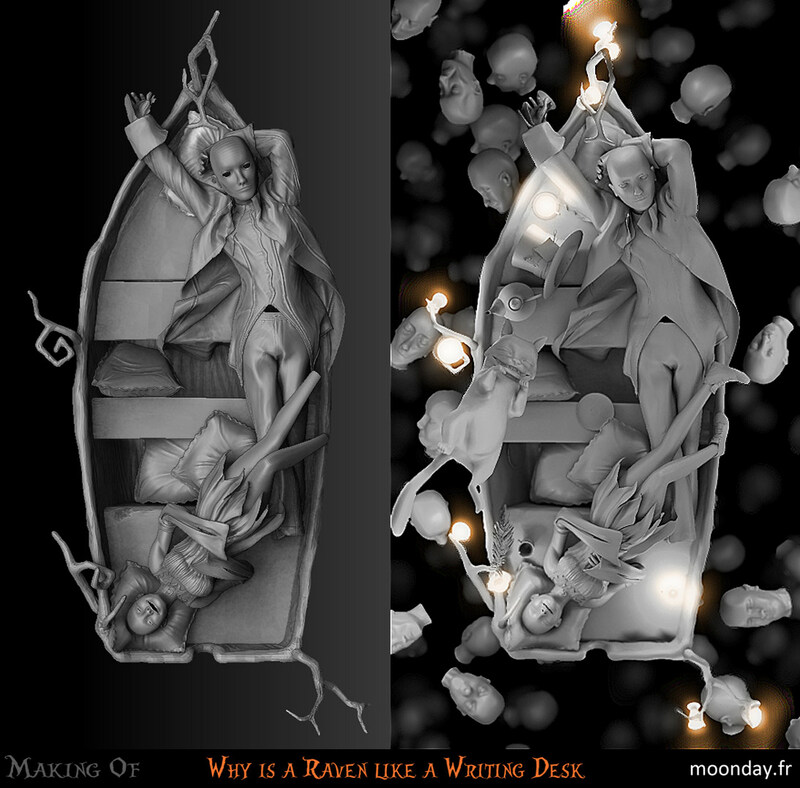 In the original scene Lewis Carroll and the real Alice are sailing in a boat, their reflections representing the Mad Hatter and Alice respectively. Water also acts as a mirror in which the elements appears from the universe created by Lewis Carroll when he tells Alice his stories. 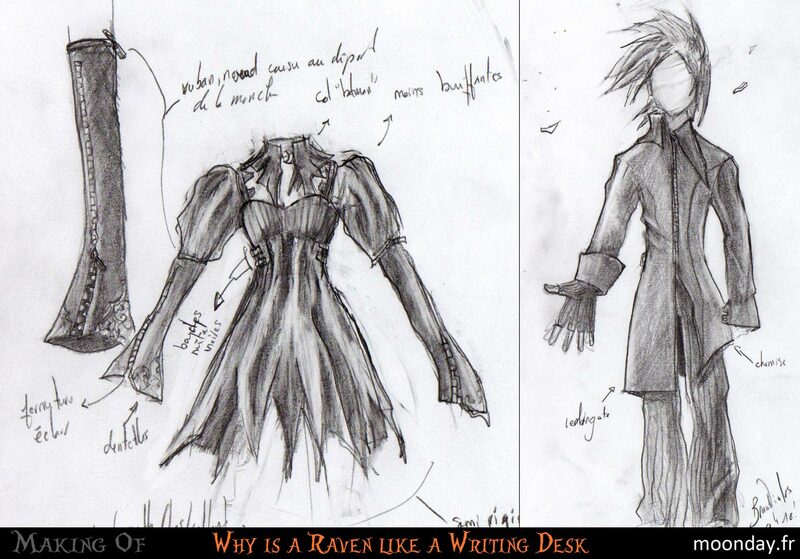 Once the scene was defined on paper I started to create characters starting with their bodies and clothing. 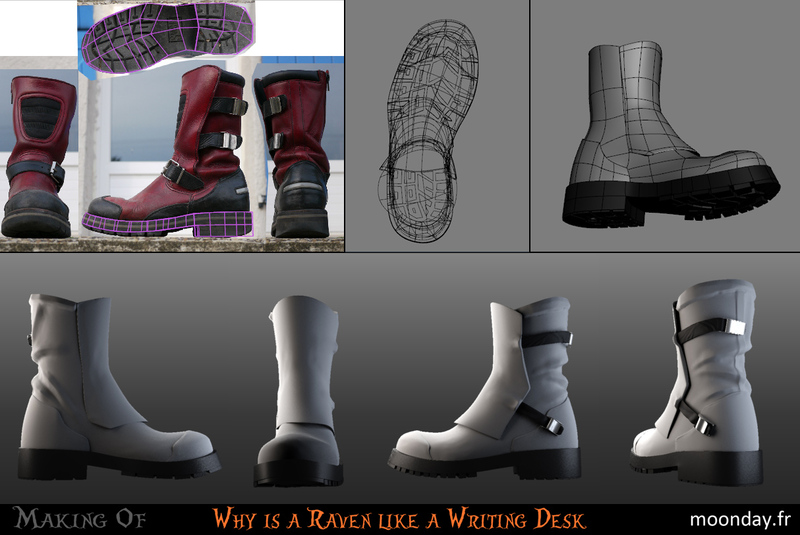 The process was the same for almost all elements of the scene, an editable poly modified with visual reference and for some models a jump in sculpting software to add details. 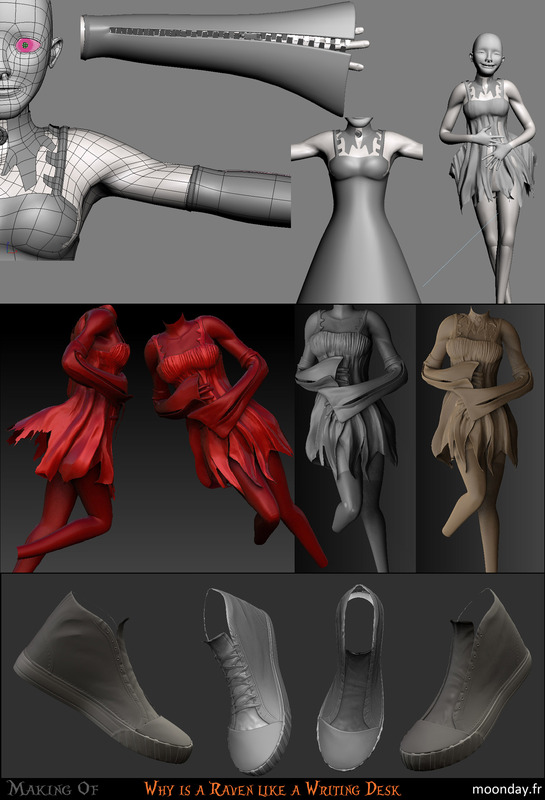 Cloth simulations were used to give good shapes to the clothes, they were then refined in sculpt mode. In order to put the characters in place, I created a quick rig and skinned the bodies, the easiest character to work on (at that stage) was the cat, his body was modeled in final position and skinned along a spline. 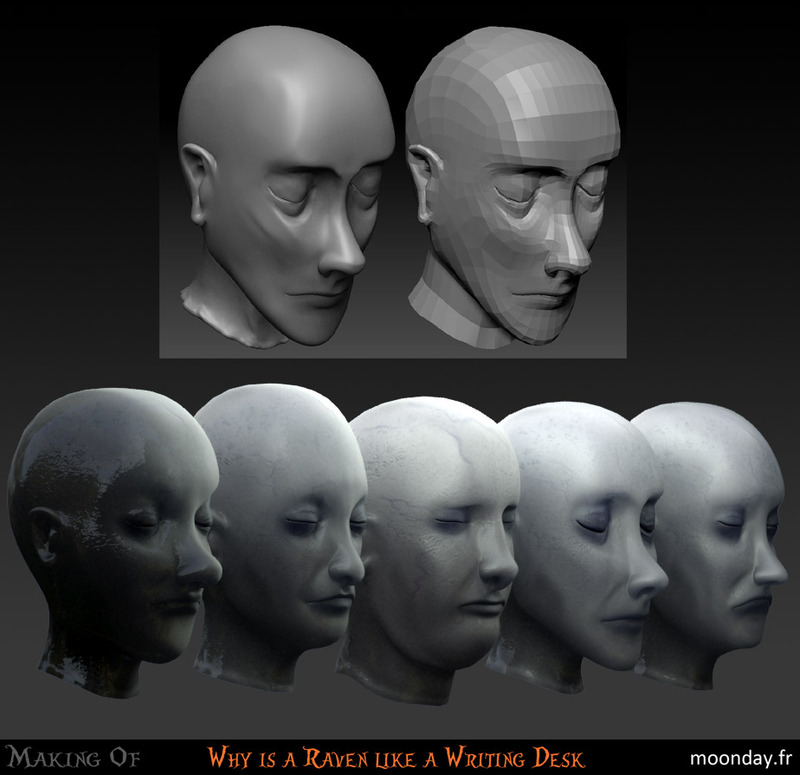 The head was separated from the body, different hair&fur modifiers were added to the model for separating the different parts to brush: Beard, mustache, nose/forehead, eyes, ears and back of the head. 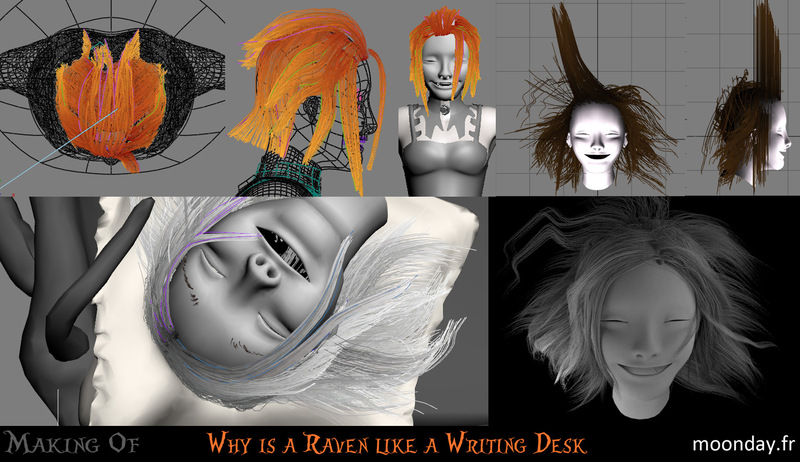 Each of these modifiers played with the multi-strand parameters, textures and noises bitmaps controlled the intensity and length of hair. 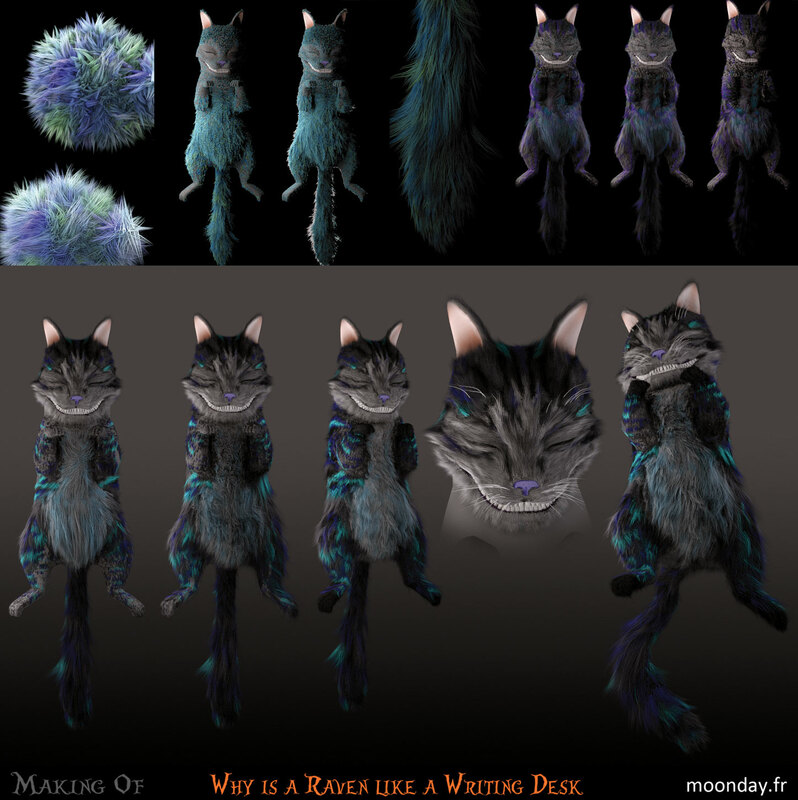 The body is made with a single hair&fur modifier. 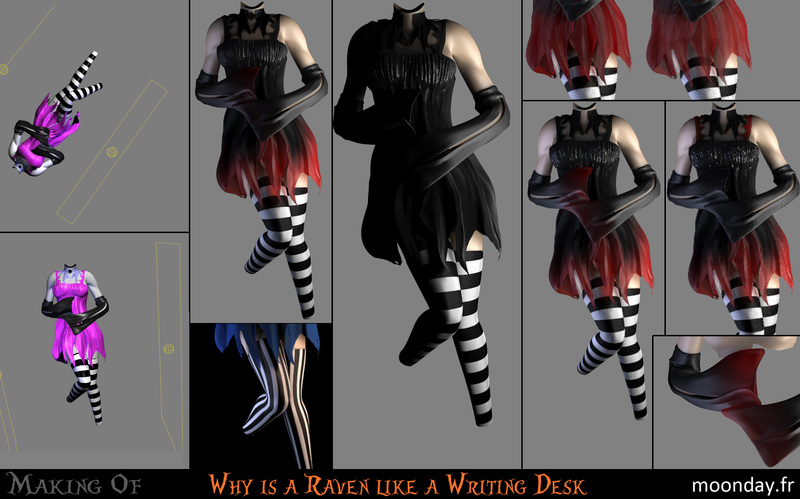 At this time in the project I could no longer count on software crashes to render hair&fur, but I was able to establish a series of tests to understand better how the shaders and textures worked with the hair. Luckily it was not an animation. 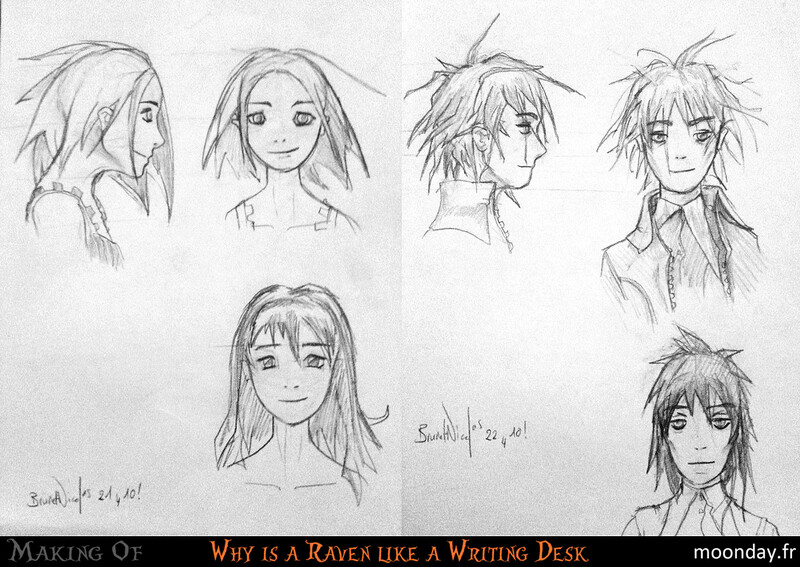 For Alice hair I initially made a modern haircut . Unfortunately a crash corrupted my scene and I had to start the styling from scratch, this time starting with Alice lying on a cushion which served as interactive geometry during brushing. 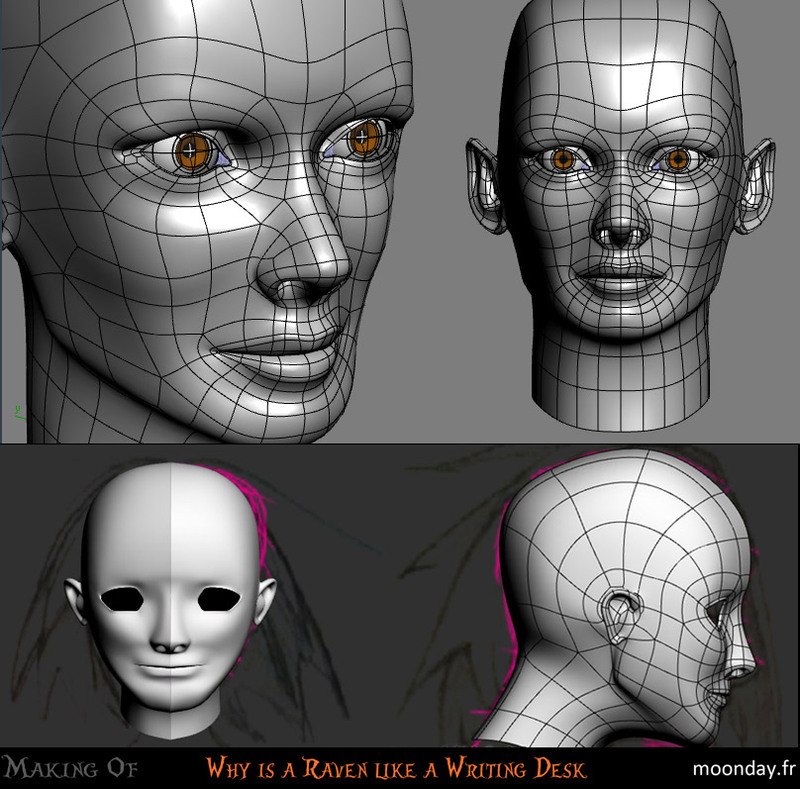 Then a few strands based on splines to cover the forehead to make them look a bit tamed. 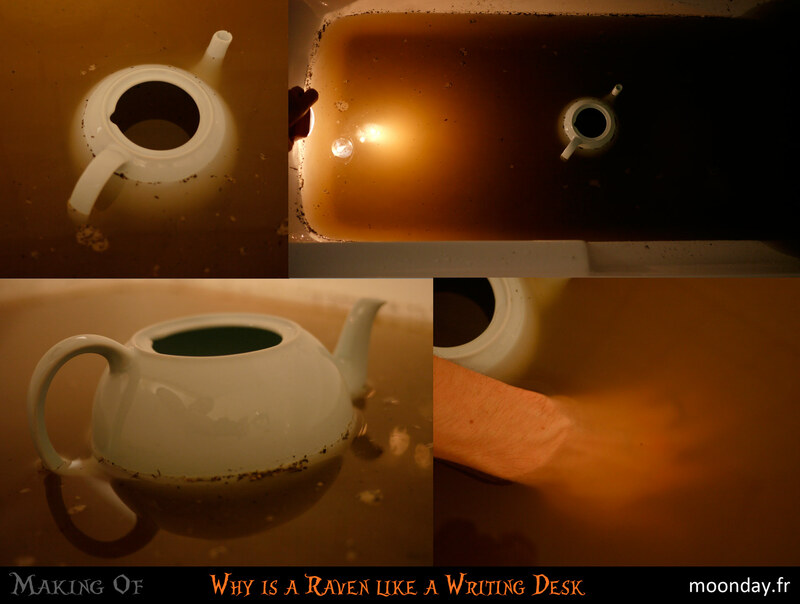 And now we come to the last challenge of the project; the muddy waters of the moat. 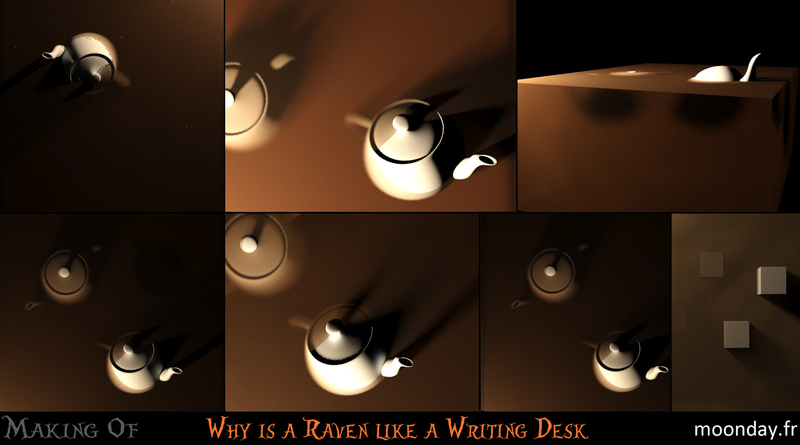 How to make a transparent surface that gradually becomes muddy while projecting rays of light filtering between objects. Finally I filled my bathtub with water and put some soil inside.